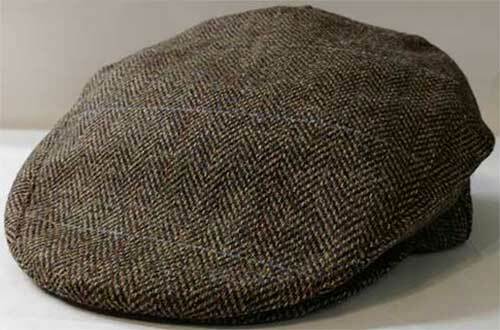 Flat cap made in Ireland of pure Irish wool that is woven in a brown herringbone pattern. These Irish flat caps are sized for the American market: Small = 6 7/8, Medium = 7 1/8, Large = 7 3/8 and XL = 7 5/8. Don't worry about ordering the wrong size or color; Irish wool cap replacements ship to you without any shipping charge.